In 1909, Royal Enfield expanded its offerings by introducing a small motorcycle with a Swiss origin motor. Fast forward into 1949 where India took to enjoy the look and feel of these genuine products. It wasn’t until 1955 when the Indian Government made the decision to employ their police departments and army forces with the Bullet 350 as the necessary bike for the job. It was then that the original manufacturer out of Redditch, Worcestershire (Redditch Company) had partnered with Madras Motors in India and formed Enfield India where the passing years saw the Bullet dominating the Indian Highways and became increasingly popular year after year. In 1994 the name changed and became Royal Enfield. Bringing this amazing brand of precision engineering closer to home, Electra Sign was asked to keep the branding intact and create a custom LED sign that would influence motorcycle enthusiasts to enter into a new experience. Read more on the history of Royal Enfield at www.royalenfield.com/ca and then drop by and visit their Manitoba showroom at 41 Higgins Ave. in Winnipeg, MB. For over 40 years, Faveri’s Wood Furniture has been a compliment to homes and businesses. A locally owned Winnipeg institution, the owners and staff understand the quality that is expected by their clients. Craftspeople themselves, they look to educate each customer on what to look for and the best solutions. 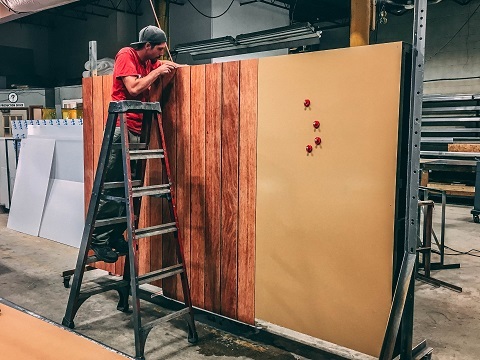 When you first open the doors to Faveri’s you will feel welcomed by the fresh smell of wood. Nothing compares to the comfort of that first step inside. More than a year ago, Electra Sign met with Robert and Lynda and discussed the options to provide enhanced marketing and awareness of their brand. After some struggles with Permits, Variances and Engineering – their existing structure was transformed into a piece of art including the latest technologies in LED and electronic messaging centres. In the fall of 2015, Steinbach recognized it's need for quality pizza and the Cook family delivered by opening Little Caesar’s. Almost 3 years later, that call came again. However, this time Manitobans would see their very first Little Caesar’s with the convenience of a Drive-Thru. Opening in the summer of 2018 at Deacons Corner, you can expect the best from this family run operation that knows what you want in great tastes. Electra Sign is pleased to be part of this successful expansion. 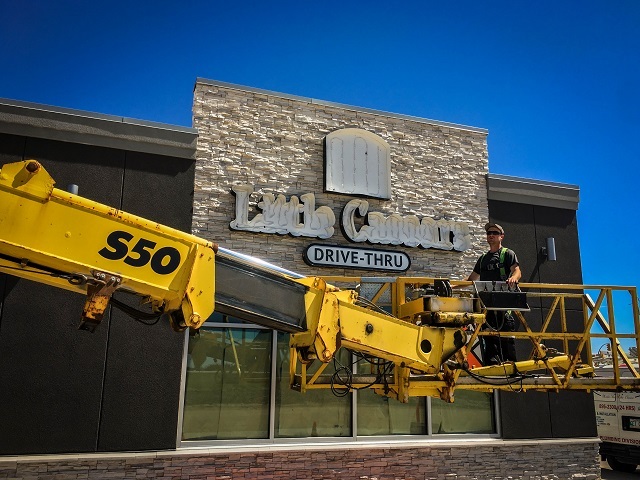 As a preferred signage vendor for Little Caesars Restaurants across Canada, we remain tasked in keeping with the detailed specs of the corporation from the curves of the letters and fonts to the LEDs that help keep the registered orange glow looking great. Complete sign solutions by Electra Sign Ltd. Winnipeg Manitoba leading the signage industry in award-winning custom design and manufacturing.